The Industry Leader in Exhaust Service. We've taken bender technology one step further with the MC-59 HI-SPEED. 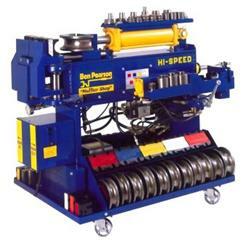 No matter what your exhaust volume, the Pearson HI-SPEED bender was designed and built for you. With over twice the bending speed of conventional benders, the Pearson HI-SPEED utilizes a rugged 7-1/2 HP motor combined with a heavy-duty electrical and hydraulic system. This bender was designed for heavy work... and it performs. Bend Depth to 180 degrees on a 5" radius.